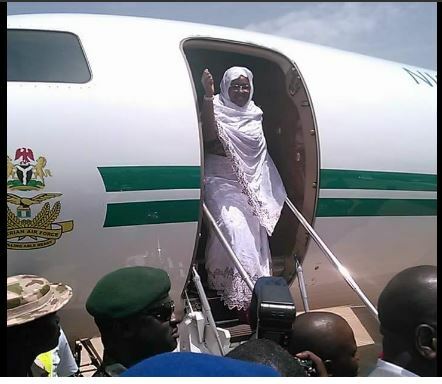 The wife of the president, Aisha Buhari, has returned to the United Kingdom where her husband is on medical vacation. Staff of the Office of the Wife of the President confirmed to Dailytrust on Monday that Mrs Buhari left for the UK on Sunday. Mrs Buhari had last Thursday returned from London and proceeded to Owerri, the capital of Imo State, where she attended the 2017 August meeting hosted by women in the state. Some of her staff hinted that there is a possibility that she will return to Nigeria with her husband at a time yet to be officially confirmed. Ok o still no president yet.. Spending our money, I didn't understand this whole thing. Well take care of your husband o.